Before the advent of microscopy, scientists such as Leonardo da Vinci had to surreptitiously dissect the human body to gather insights into its functional anatomy. Now, two-photon microscopy has further advanced our ability to peer into living tissues with minimal intervention. For instance, two-photon microscopy allows your window of vision to penetrate through a living mouse’s brain and marvel at a neuronal cell’s inner workings. Pan the microscope underneath the skin, and you will see hair follicle stem cells dividing and regenerating in real-time . Over a tumor bulge, you can observe metastatic cancer cells migrating and invading blood vessels. The mechanics of this visual journey relies on two photons meeting each other at the same place at the right time. This article will unpack the essential elements that produce such breathtaking snapshots. First, a brief introduction to the main character in microscopy: the photon. A photon is a unit of light that carries a packet of energy. According to physicist Planck’s equation shown below, the amount of energy a photon carries is inversely related to the photon’s wavelength. Meaning the shorter the wavelength, the greater the energy. The energy that a photon carries can be exploited to produce fluorescence. Fluorescence occurs when certain molecules are able to absorb photons with a specific energy and become excited . But what comes up must come down, so the molecule quickly returns to its ground state after excitation. During the descent, excess energy that the molecule did not use to jump up to its excited state is released. The molecule “fluoresces,” or emits another photon, though one with less energy than the initial photon absorbed. These molecules are called fluorophores. A prominent example is the green fluorescent protein (GFP). GFP emits green fluorescent light at 510 nm after being excited by a photon with a wavelength of 488 nm [Figure 1]. Note that fluorescence is an all-or-none phenomenon, meaning a photon with more or less energy would not be able to excite GFP in the same way. Figure 1: (Left) Light spectrum. Image credit: Fulvio314. Licensed under CC-BY-SA-4.0. (Right) Light absorption in single-photon versus two-photon fluorescence microscopy. In single-photon microscopy, fluorophores are usually excited by photons in the UV or visual light spectrum. In two-photon microscopy, each photon is usually in the infrared spectrum. In both cases, the emitted fluorescence is the same. Image Credit: Victoria Sun. Fluorescent molecules can be observed in chemically fixed tissue or through live imaging. A tissue can be preserved using a chemical such as formaldehyde to keep the structure and fluorescent molecules intact. A portion or the whole tissue can then be placed on a slide and observed using fluorescence microscopy [Figure 2]. Live cells or organisms can also be observed using fluorescence microscopy. Usually, the organism contains a fluorescent reporter, meaning a fluorescent molecule is attached to a particular protein. The reporter can be genetically engineered, such that the organism’s DNA is altered to include the fluorescent molecule. The reporter can then be observed in real-time through fluorescence microscopy. A flap of skin can be cut to expose the organ of interest under the microscope better [Figure 2, 3]. Figure 2: On the left is a chemically preserved brain. The blue rectangle represents a slice of the tissue being cut and placed on a slide for microscopic observation. On the right is a mouse undergoing live imaging. The blue rectangle represents an optical window being made by cutting a flap of skin to image the brain through the skull. Image credit: Victoria Sun. Figure 3: Microscope set-up at the skull and examples of two-photon microscopy images acquired during live imaging. Both examples show neurons (green) and vasculature (red). Bottom example uses an additional amyloid-targeting dye (blue) in an Alzheimer’s disease mouse model. Image Credit: Elizabeth Hillman. Licensed under CC-BY-2.0. This article compares two types of fluorescence microscopy: single-photon and two-photon. As their names suggest, the first method uses single photons that contain enough energy to excite fluorescent molecules in the tissue, while the second requires two photons to excite fluorophores. Within single-photon microscopy there are two microscope set-ups: widefield and confocal. 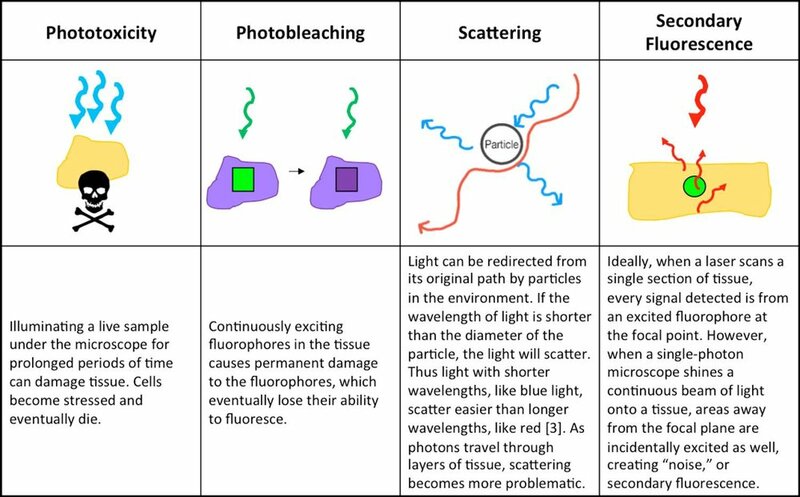 Both widefield and confocal fluorescence microscopy are plagued by four main shortcomings: photoxicity, photobleaching, scattering, and secondary-fluorescence [Table 1]. Table 1: Fluorescence Microscopy Pitfalls. Image Credit: Stephanie DeMarco and Victoria Sun, Skull & Crossbones image is licensed under CC BY-SA 3.0. Structurally, one-photon and two-photon microscopes are quite similar. The pinhole, however, distinguishes confocal microscopy from widefield and two-photon microscopy. Widefield microscopy indiscriminately accepts incoming signals, and thus receives a high influx of noise. Image resolution significantly deteriorates. Confocal microscopy improves in reducing unwanted secondary fluorescence because its pinhole detector rejects inappropriate signals and scattered light. Only fluorescence from the focal plane is supposed to pass through the narrow hole [Figure 4A], but inappropriate signals often manage to get through. Although emitted light from the sample is screened by the pinhole, excitation light from the laser is not selective. Confocal microscopy uses a continuous laser that constantly delivers photons to the sample [Figure 5]. Since high-energy light is indiscriminately shone on the entire tissue, confocal microscopy suffers from severe phototoxicity and photobleaching. Two-photon microscopy functions smoothly without a pinhole compared to single-photon microscopy due to theoretical physics principles, low probabilities, and structural components in the two-photon microscope. This difference helps explain two-photon microscopy’s superior sensitivity and resolution in deeper tissue. Figure 4: The microscope setup for a single-photon confocal microscope versus a two-photon microscope. A) In single-photon microscopy, light is shone onto the sample and a fluorescent green signal is emitted. However, outside of the focal plane, other areas of the tissue have secondary fluorescent signals. The pinhole blocks the detector from receiving these interfering, noisy signals. In two-photon microscopy, there is no need for a pinhole. Green fluorescence is restricted to the focal plane. This allows two-photon microscopy to view deeper into the tissue with more precision and better resolution. B) Fluorophores in single-photon microscopy are excited not only at the focal plane, but also in surrounding tissue. Meanwhile in two-photon microscopy, two photons only meet each other at the focal plane and excite the tissue far more selectively. Image Credit: Victoria Sun. But hold up, how does two-photon microscopy work if a fluorophore is supposed to absorb a photon with a distinct amount of energy? Maria Göppert-Mayer, the second female to win a Nobel Prize in physics, established the principle of two-photon excitation in 1931 . She hypothesized that a fluorophore could simultaneously absorb two photons, each containing half the energy needed for a single photon excitation event, to achieve an identical fluorescent effect. Although Göppert-Mayer was correct, her hypothesis could not be validated until almost 30 years later. During her time, it was difficult to capture such a rare event – two photons of equal energy need to arrive at a fluorophore at the same moment. Timing and location is key. It requires a high-powered laser to shine a dense burst of photons at one specific point so they could have a better chance of running into one another. The advent of pulsed lasers, especially the femtosecond-pulsed laser, turned two-photon fluorescence into a reality. The femtosecond-pulsed laser sends incredibly dense photon beams in ultra-short bursts [Figure 5]. One femtosecond (fs) is 10-15 seconds, which is around the time it takes for a fluorophore to absorb light . Thus, two photons need to collide with a fluorophore under that time frame for simultaneous absorption to occur. High-powered femtosecond-pulsed lasers convert a rare event into a highly efficient rendezvous. The laser focuses photons at a concentration a million times higher than that required for single-photon excitation. This incredible density increases the statistical probability that two half-energy photons will overlap in space. Moreover, the laser pulses photons for 100 fs, ample time for two photons to coincide at a fluorophore. Since most fluorophores used are excited in the 400-500 nm range, two-photon microscopy uses photons with wavelengths in the near-infrared spectrum, around 700-1000 nm [Figure 1] . Exciting tissue with lower energy photons results in substantially less phototoxicity, photobleaching, and scattering. Figure 5: On the left is an example of a laser that continuously beams photons over time. On the right is an example of a pulsed laser used in two-photon microscopy. Every 100 femtoseconds, the pulsed laser shines a high-density of photons. Image Credit: Victoria Sun. In confocal microscopy, most of the tissue is inappropriately excited and so becomes more likely to bleach. In contrast, two-photon microscopy uses lower energy photons and a pulsed laser instead of a continuous laser. Overall tissue fluorescence intensity fades less quickly in two-photon microscopy. The femtosecond pulses are so brief, and at such a low average excitation power that there is little phototoxicity outside of the focal point . These factors reduce cell injury and increase live imaging times in healthier tissue. Moreover, near-infrared light scatters far less than the visible light used in single-photon microscopy, allowing two-photon microscopy to reach 1 mm depths . The probability of two-photon excitation occurring incidentally is incredibly low, except at the focal point where the laser precisely localizes a crowded population of photons . There is hardly any secondary fluorescence since the signal is generated only at the focal point. Thus, two-photon microscopes do not need a pinhole. All the fluorescence collected by the detector constitutes a useful signal, as demonstrated on the right side in Figure 4A and B . Two-photon microscopy’s improved specificity allows better resolution into deeper tissue. Thus, two-photon microscopy is the gold standard for deep-tissue live imaging due to its superior resolution, negligible scattering, and less overall tissue phototoxicity and photobleaching compared to single-photon microscopy . In addition to assisting scientists with optically diving into living organisms to answer questions at the cellular level, this powerful instrument has clinical implications as well. A fast handheld two-photon micro-endoscope was developed recently and could potentially be used as a noninvasive tool for human patients in the future . There are safe fluorophores that could be injected into humans, and clinical examples include probing for pathologies in the skin, surgically exposed tissue, or even the intestine by attaching it to the end of an endoscope . More imaging innovations are yet to come, such that things we could only imagine seeing will soon be readily accessible. Yale University. Looking Below the Surface: Stem Cell Behavior in Real Time. www.youtube.com/watch?v=4nZfM5Dy9jc (2012, June 28). Davidson, M. W. & The Florida State University. Basic Concepts in Fluorescence. Humboldt State University. Atmospheric Scattering. Piston, D. W. & Davidson, M. W. Introduction to Multiphoton Fluorescence Microscopy. http://olympus.magnet.fsu.edu/primer/techniques/fluorescence/multiphoton/multiphotonintro.html. (2012). Herman, B., Lakowicz J.R., Murphy D.B., Fellers, T.J. & Davidson, M.W. Excitation and emission spetroscopy fundamentals. http://www.chem.uci.edu/~dmitryf/Downloads/Readings.html. (Accessed: 20 Aug 2018). Helmchen, F. & Denk, W. Deep tissue two-photon microscopy. Nature Methods. 2(12), 932–940 (2005). Svoboda, K. & Yasuda, R. Principles of Two-Photon Excitation Microscopy and Its Applications to Neuroscience. Neuron. 50(6) 823–839 (2006). Park, Jung-Hoon, et al. High-resolution in vivo imaging of mouse brain through the intact skull. Proceedings of the National Academy of Sciences. 112(30) 9236–9241 (2015). Phan, T.G. & Bullen, A. Practical intravital two-photon microscopy for immunological research: Faster, Brighter, Deeper. Immunology and Cell Biology. 88(4) 438–444 (2010).